Branson Segway is a great way to enjoy great outdoor fun in Branson and the best of autumn as you take a fun ride with this fantastic personal transporter. The unique outdoor fun that you can enjoy with the Segway gives you the opportunity to see the beautiful foliage when its colors change in autumn. Segway allows you to experience a free-roaming adventure where you will enjoy a unique fun ride in a paved track. This amazing outdoor fun in Branson offers everyone a fascinating and exciting ride for young and old. Riding with the Segway is easy and safe for family and friends who come to play at the free-roaming paved track in Branson. If you want to enjoy the best of autumn, try to take a ride adventure with the Segway on the 10,000 acres vast land of Dogwood Canyon Nature Park. In the area, you will see the foliage that turn to luscious red and orange from vibrant green. The park is home to many outdoor activities that include Self-Guided Walking Tour, Guided Fishing, Guided Tram Tour, and of course the guided Segway Tours. The park features an Outdoor Café where you can have a delicious lunch after you have enjoyed a great adventure ride with the Segway. 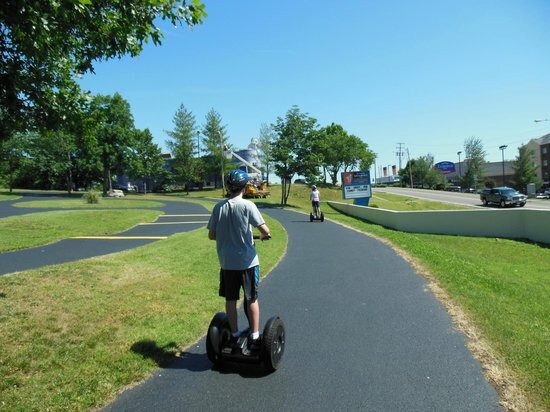 Branson Segway and Adventure Center has about two acres of paved tracks which is perhaps the only free-roaming Segway park in the world. Every rider of the Segway in the paved track of the Center loves the freedom and sensation that Segway ride adventure offers. With the amazing Segway fun ride in a paved track, you’re sure to enjoy the best time of your life. Segway adventure ride is great for kids of any age. However, there is a minimum weight requirement of 100 lbs. up to a maximum of 275 lbs. The Center offers Segway riders three different levels of ride and amount of times. Level 1 has a time duration of 7 minutes, 15 minutes for Level 2, and 20 minutes for Level 3. Segway ride adventure offers a great outdoor fun in Branson because family and friends enjoy each other’s company while enjoying the best of autumn as they see the beautiful foliage in every corner. The center features a trained staff ready to teach everyone how to be safe in riding Segway personal transporter. Every rider who is interested to ride with the Segway will be taught how to ride self-balancing in no time. Each rider will be accompanied in the track to make sure they feel confident and comfortable before letting them start the outdoor fun adventure in the paved track. Each rider will be provided by the Center list of things that are needed to take the Segway adventure ride. These things include protective helmet, sunglasses (optional), pro instructions, and the desire to learn fast the Segway adventure ride. If you want to enjoy the best of autumn and great outdoor fun in Branson, take an adventure ride with the Segway personal transporter.